The Disney Pixar Animation movie, Toy Story, involves the boy Andy and his cowboy toy named Woody whose goal is to save the toys and keep them all together. The toys are this amazing, tightknit group that defend and love each other to the max. Woody had taken upon himself to make sure the toys are safe and never forgotten. One day threatens his mission like none other though: Andy’s birthday. During this stressful day, the toys are on the lookout to see if Andy receives any new toys. Under their witness, he only receives one, but it is one that will change the toys forever. This new toy is named Buzz Lightyear: space ranger. Buzz truly believes he is an actual space ranger. In his first moments of being with the new toys he believes he has landed on a new planet and attempts to learn all he can about this “strange new world”. With his new looks and wide range of features everyone becomes impressed with this new toy. This leads Woody to dislike Buzz as he quickly loses his spotlight, fading into the background. 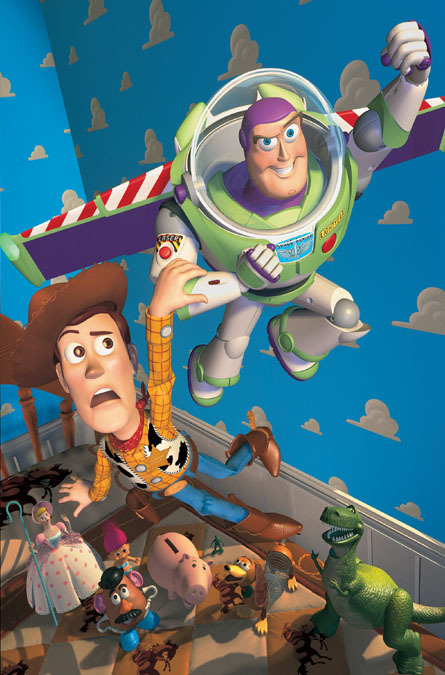 What is most devastating to Woody is the fact that Buzz impresses Andy. Woody had taken immense affection to Andy and is not comfortable sharing the love and attention. With jealousy overwhelming Woody, he takes Buzz as his enemy and attempts to turn the other toys against him. In a world of spacemen and cowboys, Woody feels as though there is not enough room for the two of them. As the plot continues, the conflict between Buzz and Woody leads them into multiple fights, onto the street, into two different cars, and finally into claw game situated inside of a pizza shack. Inside the claw game, Buzz feels as though he must take his fate with the “almighty claw” while Woody thinks otherwise and tries to escape via a hole at the bottom of the game. The infamous Sid, who was previously seen violently beating up another game, walks around to the front of the machine and begins to play. The punk child ends up winning the two when Woody tries to escape, but Buzz refuses to leave, resulting in Buzz being captured with Woody attached to his leg in an attempt to rescue them. Once Sid finds out that he has won two unique toys, his ideas begin to go wild as he plans to do surgery and play “doctor” as he did with his other toys. When he gets his new rocket, his intentions change as he deems Buzz the most suitable “passenger”. The two, Buzz and Woody, try multiple times to escape Sid’s house resulting in Buzz becoming overly confident in his abilities as he attempts to fly with his equipped pop-out wings. Unfortunately, he realizes he can’t actually fly and crash land losing his arm. He also rips off his communication sticker as realized that he was wrong the entire time. This failed attempt brings the two into deeper trouble as Woody then gets locked inside a milk crate that is weighed down by tools and Buzz is taped to the rocket, staring out the window onto the rainy outdoors. It is at this moment that Woody makes his flawless speech to get Buzz out of his depression of not being able to fly for real. Woody is excited and pumped when Sid is finally asleep and he is pleading to Buzz that it is the prime time for escape but that he cannot do it alone— he needs Buzz’s help. Buzz refuses to help as sadness creates a stubborn psycho-paralysis. He is in a state of depression due to the fact that he cannot fly or do anything the commercials and packaging he came in led him to believe. He had built all these high hopes and dreams that he can no longer accomplish. Buzz believes he is simple meaningless toy as he explains to Woody that he can’t help anyone. Woody tells Buzz that he is not just a toy. Woody emphasizes to Buzz that he is an exceptional toy, but most importantly he is Andy’s toy. To Woody, being Andy’s is the best thing in the world. Knowing Andy better than anyone, Woody is a highly credible source as he explains why Buzz is so important to Andy. When Buzz feels down, Woody explains that Buzz is far more fortunate than he realizes (ethos). Woody also finally admits that he was jealous of Buzz because Buzz was “too cool” with all his awesome features. As Woody talks to him, he realizes that he is actually like and loved by the other toys and by Andy. Though Woody’s words seem sad, they are of truth and appeal to Buzz’s emotions as Buzz understands why Woody is so sad and jealous (pathos). This level of truthfulness allows Buzz to trust in Woody on a whole new level, possibly even more so than any of the toys back at Andy’s house. The motivational speech from the fearless leader starts a fire inside Buzz as he begins to see the logic in Woody’s plan to escape and understands that by helping Woody, he is also helping himself (logos). As the audience watches the scene unravel, we feel bad for Woody. We understand the heartbreak of feeling replaced by something better especially when you have created a very impressive relationship. Woody feels as though Buzz has replaced him entirely in the eyes of Andy. When Buzz gets introduced, everything related to Woody was replaced by spaceships and pictures of the stars. Even Woody himself is tossed to the side to make room for Buzz. Woody was saddened as he leads himself to believe that Andy does not care about him whatsoever. The reality of the situation is that Andy is falling into depression when he cannot find Woody. He falls asleep, wishing for the presence of woody and holding Woody’s look-a-alike Cowboy hat. Even the toys back at home state the fact that Woody has no idea how much Andy truly cares about him. With these conflicting ideas, the audience begins to feel helpless. The actions of Andy while Woody is lost demonstrates that even though he was incredibly fascinated with Buzz Lightyear, he can’t replace the relationship he had built with his first true friend: Woody. Woody’s speech demonstrates that even though he may have been replaced and is highly jealous of Buzz, Buzz needs his help as much as Woody needs Buzz’s. Woody comes to terms, understand that Buzz is his only hope and gives it his all letting Buzz know just how important he is. This “melts” the audience as they see Woody trying to cheer Buzz up which contradicted Woody’s previous intentions that got them into this situation in the first place. This allows for one of the warmest endings of all films. Even though the turning point of the movie is sad, the toys came together and save the day once again. There are so few movies this exciting and happy, but this one definitely sets the standard. When we were kids, our toys were our life and being able to see a movie that shows our childhood come to life presents one of the best movies of all time: Toy Story.